SolarWinds Storage Manager 5.0.1 monitors storage and virtualization systems, identifies performance bottlenecks and reports on storage performance across the infrastructure. SolarWinds Storage Manager 5.0.1 earns the bronze medal in the storage management tools category in Storage magazine's/SearchStorage.com's 2011 Products of the Year competition. To get more information on each of the winners, read our best data storage products of 2011 guide. 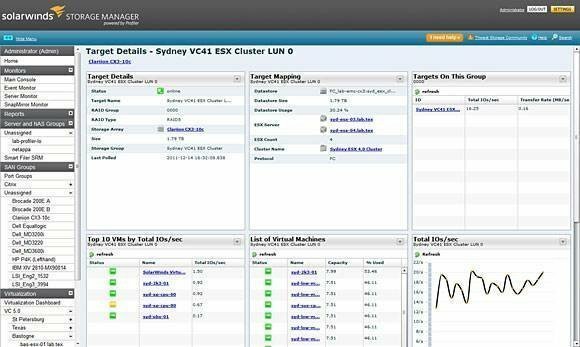 SolarWinds Storage Manager 5.0.1 monitors storage and virtualization systems, identifies performance bottlenecks and reports on storage performance across the infrastructure -- within a host, switch or array from multiple vendors. It also eases the job of storage capacity planning at any level -- from the virtual machine to the virtual server to the logical unit number (LUN) to the storage array -- and maps virtual machines to spindles to identify the physical host of a particular app’s data. SolarWinds touts the product’s ability to deliver visibility in a virtual environment from the hypervisor all the way through to the disks in the storage array. Storage Manager 5.0.1 added a per-disk pricing model, support for thin provisioning on VMware servers and storage arrays, and support for EMC’s VNX and IBM’s Storwize V7000 storage systems. The product also gained integration with SolarWinds’ network and virtualization monitoring tools, Orion Network Performance Monitor and SolarWinds Virtualization Manager, respectively. SolarWinds Storage Manager pricing starts at $2,995, including maintenance for one year. Find out the other winners in the Storage Management Tools category.